So, the long wait is finally over, yeah for me. I have FINALLY found a mascara that I love. I posted a clip for this a while back asking for input, and i recieved some good tips, but unfortunatly no one won my contest. I found this mascara a few weeks ago and I'm hooked! The first couple of times I used it I wasn't so sure, but after a few times, It worked wonders! Yes wonders! The key is slow long strokes. 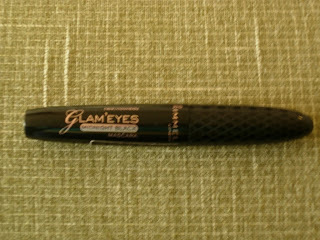 Rimmel makes it,it's Glam'eyes, and I get Midnight black. I also love some of their eye shadow, but have not been able to get anymore, mostly due to walmarts stocking habits, or lack of stocking the same item habit. I love this new find of mine and until they create something even more spectacular, I'll be purchasing this in bulk, also due to walmarts not stocking the same item habit. Try it and love it. Because I love it, love it, love it. Wait wait wait our site has had that name since it began notice our blog website address. I think subconciously you thought it sounded good as did I 7 mo. ago when you changed it recently it used to be Heslop Family right? I can't change the web address without starting a whole new blog.